"When citizens cannot have rigorous analysis of the exercise of the power that is in their name and they have granted, the rest of the foundation of our democracies start to erode at the same time as cynicism arises." The press freedom advocacy organization Reporters Without Borders has developed a six-page international declaration on information and democracy to establish basic principles for the "common good of mankind." 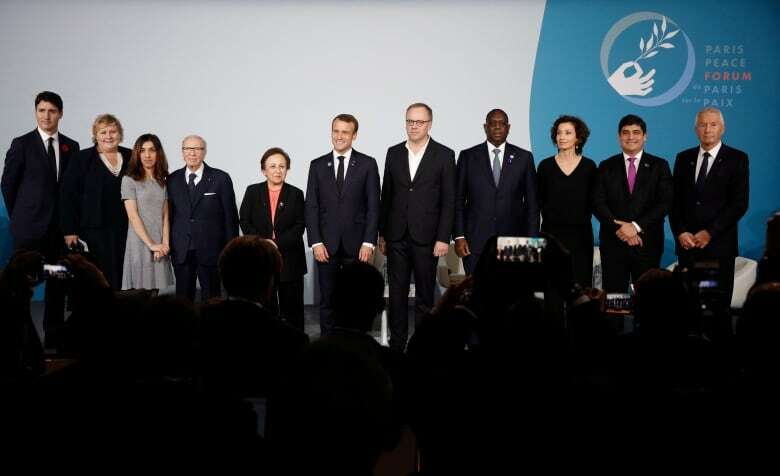 The organization hosted a small event on the sidelines of the Paris Peace Forum late Sunday afternoon where five presidents and prime ministers, including Trudeau, offered endorsements for this declaration. The Paris Peace Forum, intended to be an annual gathering of political, business and civil society leaders to explore peaceful solutions to the world's problems, was hosted by French President Emmanuel Macron to coincide with this weekend's events marking the centenary of the armistice agreement that ended the First World War. 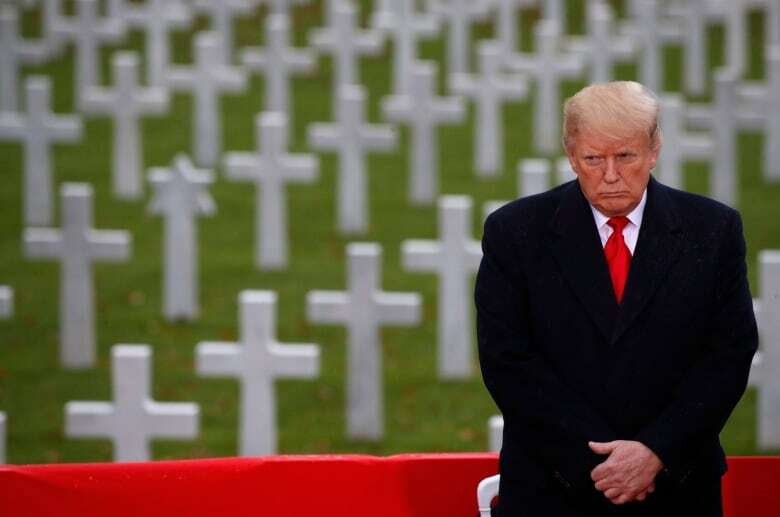 "There have always been tensions between those who would speak truth to power and those who like having their power, thank you very much, and don't necessarily want to see it frittered away," he said. "But we are now in a phase where that capacity to speak truth to power, the very capacity for a citizen to engage with truth, is under attack. And not just by the powerful, but by those who would see our institutions themselves weakened." It wasn't clear exactly who Trudeau was referring to with this remark. But in recent elections, efforts to spread misinformation to voters, particularly on social media, have been blamed on Russian President Vladimir Putin's government, which is said to want to destabilize other governments to increase its own influence around the world. When the pair was spotted chatting together briefly before the event started (for roughly 30 seconds), journalists covering the prime minister's trip asked his office for information on what the pair discussed. 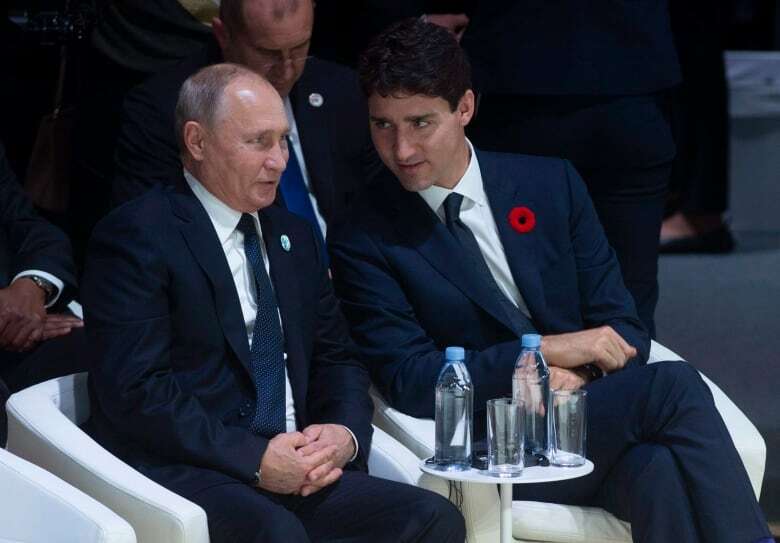 A spokesperson replied that Trudeau "acknowledged the Russian people's extraordinary sacrifices through the two World Wars," and that "therefore it's important to have Russian representation here to talk about peace." Freeland spoke about the importance of a free press during an event hosted by CBC's The National last Thursday evening, telling the audience both she and the prime minister had been thinking a lot about the issue lately. "Attacks on the media are not just about getting your preferred political candidate elected," he said. "They're about increasing the level of cynicism that citizens have toward all authorities, toward all of the institutions that are there to protect us as citizens." Citizens are feeling "very real anxiety," Trudeau said, because their jobs are transforming as globalization increases competition around the world. When that anxiety is exacerbated, it undermines trust in institutions and increases cynicism. "One of the bulwarks against that, and one of the institutions that is most under stress right now, is a free-thinking, independent, rigorous, robust, respected media," the prime minister said. Trudeau didn't mention Donald Trump by name in his remarks, but the American president's increasing hostility toward the press that covers him is becoming more and more apparent, as he refers to critical reports as "fake news" and insults journalists as they try to do their job covering his administration. "When people feel their institutions cannot protect them, they look for easy answers," Trudeau said, "in populism, in nationalism, in closing borders, in shutting down trade, in xenophobia." Trump and Trudeau had a chance to speak Saturday night at a dinner hosted by Macron. A Canadian official speaking on background told reporters they had a "good interaction," although no specific topics were offered. Myanmar is a member of the Association of South East Asian Nations (ASEAN), which is holding its annual summit this week in Singapore. Canada is a "dialogue partner" of the ASEAN group, and Trudeau is scheduled to leave for Singapore Monday afternoon.